Combining the small form factor of mini-ITX with the performance potential of full sized components is an increasingly popular ambition for enthusiasts and manufacturers alike. While mini-ITX boards can’t manage the power demands of six-core LGA1366 CPUs Intel’s line of dual-core LGA1156 CPUs or AMD's EE range of Socket AM3 chips are ideal, allowing you to cram a whole lot of performance into a remarkably small board. The problem then comes when you start looking for a case for your mini-ITX powerhouse, as there’s a painfully small range compared to full ATX models. Up until now it’s seemed that only SilverStone, with its SG05 and SG07 has been paying attention to the mini-ITX market. We had high hopes that Fractal Design's Array R2 would join this list, but we were ultimately disappointed. 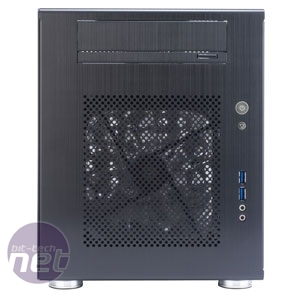 Now aluminium case specialist Lian Li is entering the mini-ITX market with the new PC-Q08. 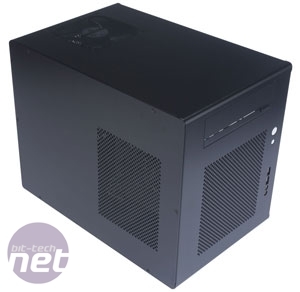 Whereas the Sugos SG05 and SG07 take more than a few design cues from small form factor Shuttles, the PC-Q08 is far more like a standard ATX case, though miniaturised. At 227 x 345 x 272mm (w x D x H), it’s still much smaller than many micro-ATX cases out there (Silverstone makes a few about the same size), while boasting support for a whole range of full size components. 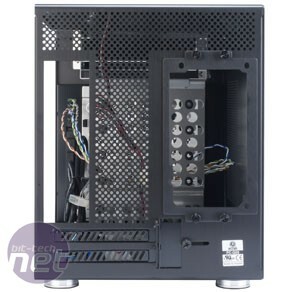 An ATX PSU will fit inside, as will a 5.25in optical drive, up to six 3.25in hard disks and the case will house graphics cards up to 300mm (11.8in) in length. 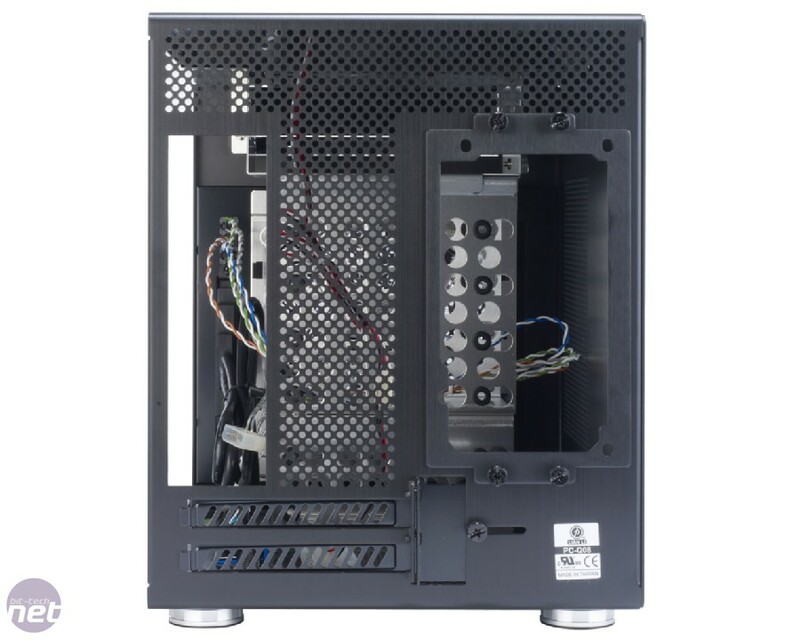 This makes the PC-Q08 the most accommodating mini-ITX case we’ve seen yet. The PC-Q08 is made from black-anodised, brushed aluminium and is also available in silver or red (look for the B suffix for our black version, R for red and, weirdly, A for silver). The front fascia, roof and rear are all part of a single curved piece of metal, an impressive feat considering the number of cuts and holes involved, from ventilation grilles to fan mounts to expansion slots. The uni-body build gives the Q08 an assured classy, curved look; it’s a frankly gorgeous bit of kit. As with almost all aluminium cases though, it’s a finger print magnet, so watch those greasy fingers when building a system in it. 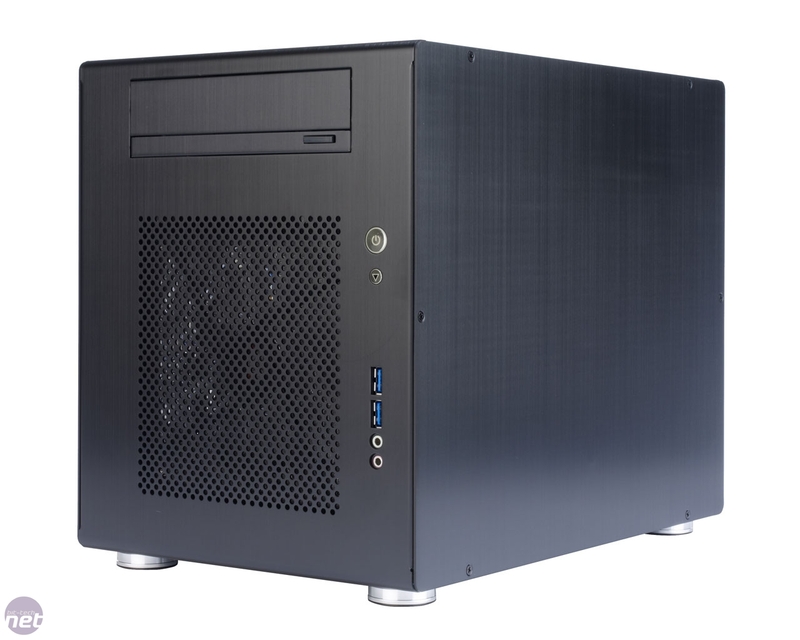 In the past we’ve seen plenty of mini-ITX cases with little or no thought given to cooling, so it’s good to see the PC-Q08 ship with not only a 140mm front intake fan, but a 120mm roof-mounted exhaust too. This airflow is aided by extensive venting cut into the panels that make the floor, rear and left-hand side. 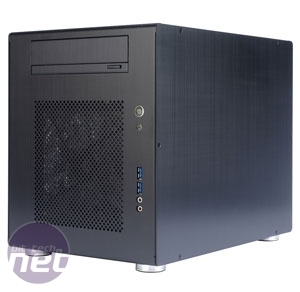 The close proximity of the fans to the hardware should result in very effective cooling, vital considering that this case can fit graphics cards up to and including a GeForce GTX 480. The front 140mm is a blue LED model, and is fitted to an internal mount that incorporates a removable dust filter. This is the only dust filter present in the case though, so air sucked in via the underside or side panel venting will carry dust inside. As well as the front 140mm fan’s venting, the front fascia also includes a flip-down plate to hide the 5.25in optical drive, plus power and reset buttons, mic and headphone ports and two USB 3 ports. As USB 3 has yet to get a standardised, certified motherboard header, the cables from these ports terminate in male USB 3 connectors to loop out of the back of the case and plug into the ports on a motherboard's rear I/O panel. We like the addition of USB 3 ports at the front of the case where we can use them, and Lian Li's implementation is the neatest possible at this time. 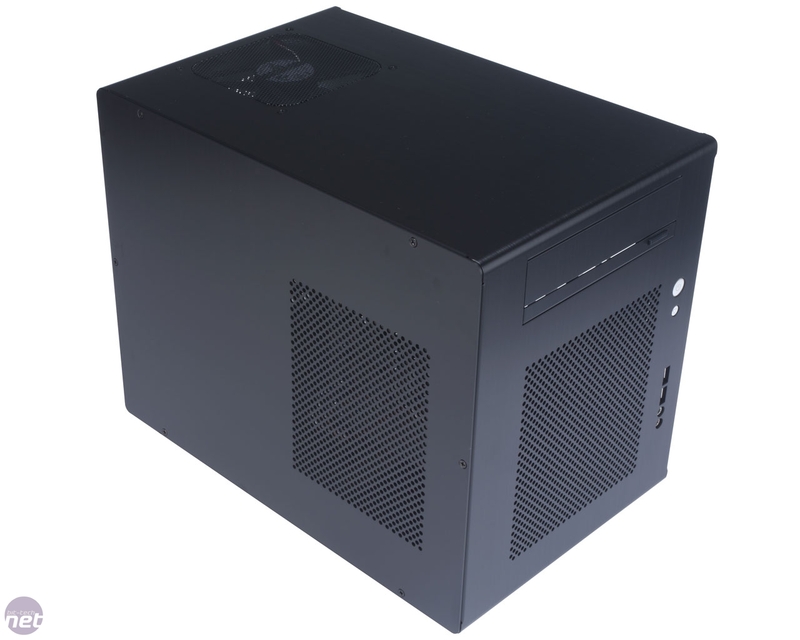 Lian Li has looked to the automotive industry for its latest mini-ITX case design. 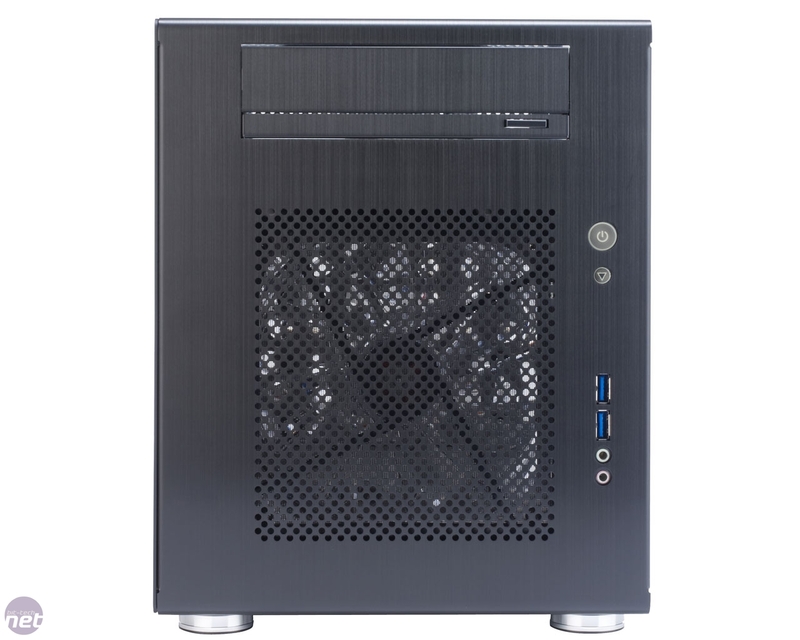 A tiny, brushed aluminium case for a mini-ITX gaming PC - but can it handle the heat?